This month’s travel blog takes us to right to the heart of the Blue Ridge Mountains of Virginia and the greater Roanoke area. 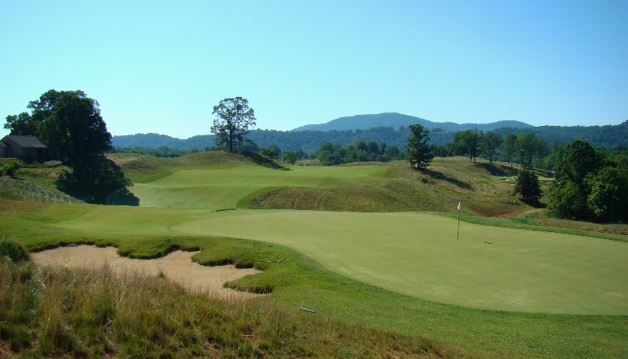 Roanoke – a city home to about 100,000 residents – sits in a bucolic valley setting amongst three to four thousand foot peaks in all directions, providing for some of the most majestic terrain for golf in the mid-Atlantic region. The city itself offers a vibrant downtown core, splashed with restaurants and nightlife. The ever popular Blue Ridge Parkway runs virtually right through town. Sight-seers can get a great view of the entire valley from atop Mill Mountain, home to the famous star that provides Roanoke its moniker, “The Star City”. Among the stars in the golf landscape in the region, one needs to look just off the Parkway south of town to find the area’s newest course, Ballyhack. This Lester George design – built as a national private club to serve as a quiet mountain getaway for business execs – it offers dramatic long views from its many elevated tees and wide open fairways. Don’t stray too far off course however, its 7294 yards has plenty of teeth, as the 155 Slope/76.6 Rating testifies. Fear not the private label, however. Ballyhack does offer a great stay & play package with lodging providing on site in 4-person golf cabins with private bedrooms & baths for each player. When looking for a 5-star experience, you will find it here! Hanging Rock (6828 yards/125 slope/72.3 rating, $48 peak rate) is a Russell Breedon layout that provides true mountain golf. Fire your way up and down the gentle slopes and enjoy the views! The 6th hole features two greens, one on a perch, the other on a lake that affords players the luxury to choose which green best fits their game. Ashely Plantation (27 holes) is another Breedon gem tucked away in an upscale development north of town. The original 18 plays as a championship course (6967/134/73.2, $45) featuring a 721 yard PAR SIX on the card and dramatic elevation change. The newest nine features a neat quirk, a separate set of tees that enables the regular length holes to all play as par threes! Could be an interesting way to complete 36 on site before retreating for dinner? 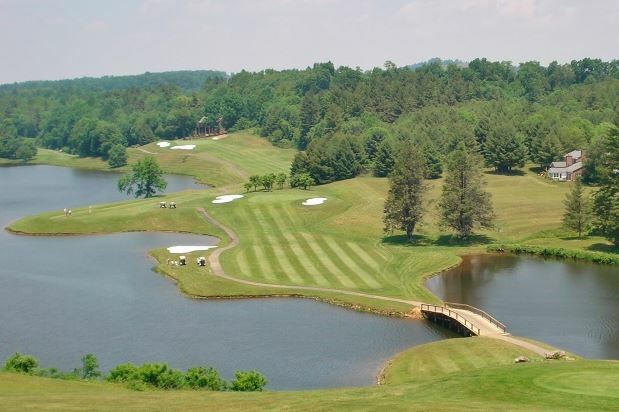 Right next door, you’ll find Botetourt Country Club (pronounced BOT-a-tot). A favorite course of locals, you’ll find great conditions and greater playability (6133/116/68.7, $40) than its brawny neighbor. You may leave town with your fondest memory being how you hit your tee shots into the Blue Ridge backdrop! The River Course at VT is a beast. Pete Dye painted 2.5 miles of New River shoreline with his devious brush. The new clubhouse is worth the trip alone, so enjoy a craft brew from Bull & Bones Grill on the Cliffside deck overlooking the back nine. Olde Mill has the most intimidating tee shot in Southwest Virginia. Caddie Tip: buy an extra sleeve of balls at the turn. Your 10th tee shot is hit from just off the hilltop clubhouse, down to a peninsula fairway engulfed by the course’s manmade lake. They also have golf villas on site if you want to move the entire operation after a day in the city. Poplar Grove is a modern beauty with classic overtones that delights the eye. That combination is no doubt owed to its two designers, the incomparable Sam Snead (his last design) and Ed Carton (formerly worked with Tom Fazio’s design team). Hotel Roanoke is right in the heart of downtown. A true throwback! Landon Owen is a self-professed golf addict whose first job out of college was selling golf packages in the Carolinas. With 201 different courses played under his belt (on his way to a goal of 1000), he enjoys sharing the game with others through play, travel, written word, movie quotes and photography.